Located in the upscale neighborhood of Nyali on the Mombasa mainland is the Mombasa Academy private school. Both boys and girls attend the school, with approximately 500 students as of the 2008 school year. The Mombasa Academy is structured in a British manner, with each level or class being relatively equal to those in the UK. Enrollment starts early at ages 2 and 3 for their playgroup level, and rises up to Class 13 and the A level exams. The classes are divided up into the Junior, Preparatory and Secondary schools. Each school has it's own buildings but they are all on the same campus. All students above the playgroup class wear uniforms, and also dress in their house colors. All the classes are taught in English, and the school day runs from 8am until 3pm with an hour off for lunch between noon and 1pm. After school sports and activities may push the school day until 4pm. All of the subjects covered at the school are what would be found at a typical UK or North American school. There are classes in English literature, chemistry, mathematics, geography and history. Computer literacy is started at Classes 1 and 2, to help students excel in the modern world of technology. Non-academic subjects include French, art, music, drama and physical education. A very well-rounded education. Aside from the academic program, the school has a wide-range of extra-curricular activities to provide a balanced and enriched education for its students. There are programs in drama, music, art, and a large number of sports and athletic pursuits available. The school has a half Olympic-sized pool on the grounds for swimming and water sports. Two activities per week are suggested for students, who take part during their lunch breaks or after classes. The school was founded in 1978 by F.J Bentley, and the academy has grown continually in the years since that time. Land has been added to the campus for additional sports fields, new science labs have been constructed and accommodations have been included for the teaching staff. There is a large library with full-time staff, and an up-to-date computer lab for all students' use. 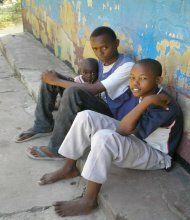 The Mombasa Academy is considered an international institution, and many nationalities are found within the student body. But it is not a boarding school, and all students live off-campus in the surrounding city.